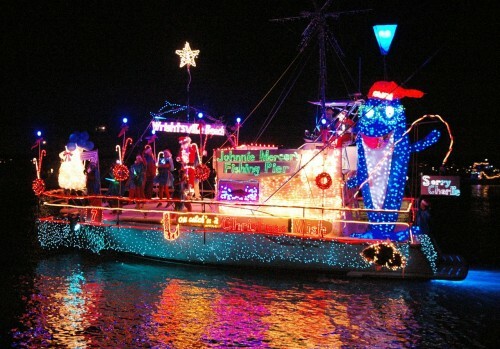 Wrightsville Beach, N.C. … Named one of the Top 20 Must See Events in the Southeast, the North Carolina Holiday Flotilla celebrates its 30th anniversary, Nov. 29 and 30 in Wrightsville Beach. The Thanksgiving weekend family festival attracts 50,000 visitors to its culminating event, a maritime parade featuring 30 thematically decorated power yacht and sailboat floats. The spectacle, reflected in Banks Channel, glitters with thousands of twinkling lights. Weekend activities begin with the launch party and silent auction at Blockade Runner Beach Resort at 7 p.m. on Friday, Nov. 29. Sponsored by Atlantic Marine, tickets are $25 and include heavy hors d’oeuvres, cash bar and dancing to featured entertainer and Beach Music legend, The Craig Woolard Band, from 8-11 p.m.
Official North Carolina Holiday Flotilla 30th anniversary swag; handcrafted originals by more than 100 artists; an antique car show; and a dedicated children’s play area equipped with inflatable slides, bounce houses and featuring rides on the Arab Choo Choo can be found at Wrightsville Beach Park during the festival’s Day in the Park, 10 a.m. to 4 p.m., on Saturday, Nov. 30. Admission is free for the entire family. 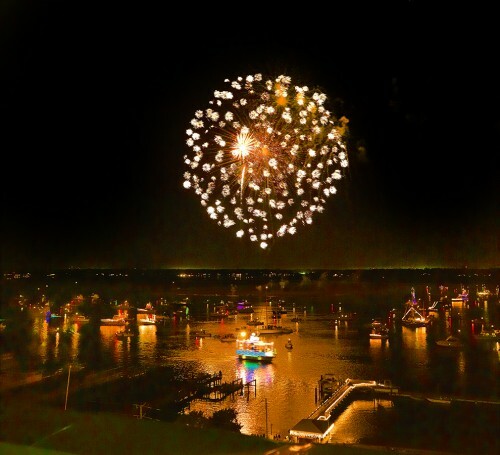 Immediately following the twilight boat parade that begins at 6 p.m. Saturday, Nov. 30, fireworks will shower the waterway during a stunning 21-minute pyrotechnic show orchestrated by the famous Zambelli International. An excellent vantage point for viewing the flotilla and its grand finale is from the Blockade Runner Beach Resort’s Banks Channel waterfront, site of the official judge’s tent. The Blockade Runner, host hotel for 30 years, will officially announce the beginning of its own 50th anniversary by decorating and launching a 50-foot yacht in the flotilla. For the tech savvy spectator, interactive features of this year’s festival include text-to-vote for the People’s Choice and Crowd Favorite awards. Prizes will be awarded from local merchants to 30 randomly selected voters. Voters can simply text 24587 and cast ballots by vessel number (e.g., “boat35” or “boat41”). Boat captains will vie for a $20,000 purse of cash prizes that range from $500 to $1,500. The Best in Show winner, selected by a panel of celebrity judges including John Boy, will receive a 17-foot Carolina Skiff with motor and trailer contributed by Hutchens Law Firm.